﻿ the furious hunt from the Untersberg mountain Salzburg Austria. 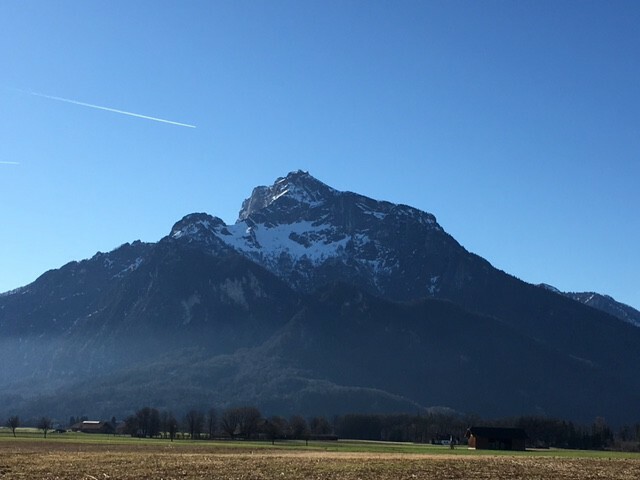 The Untersberg Mountain is one of the most important mountains close to the city of Salzburg. A lot of red marble stone and the drinking water reserve of the city are coming from there. But it is also a mountain full of mythology during history. So the Untersberg Mountain is connected with Kaiser Karl, Barbarossa and a lot of other rulers within Europe. This time we are going to write over a special hunting society. The furious hunt from the Untersberg mountain. 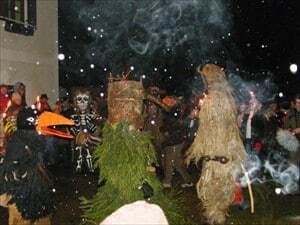 The furious hunt (Wilde Jogd) is a very old tradition in the area surrounding the Untersberg mountain. It seems as the root of this tradition is coming from the celtics that were living here in the area of Salzburg – their kingdom Noricum – at about 200 years before christs birth. In old mythology books they mention the wild huntsmen and the furious hunting society from the Untersberg mountain. The society should awake dead people of the marsh area surrounding the mountain. There are 12 typical figures within the hunting society. They represent the twelve days between Thomas’ day on the 21st December and the 6th of January – the day of the adoration of the three magical kings. In former times people were very scared in these misty and dark days of the year. Vorpercht: The Vorpercht the first one of the cavalcade and also says their special poem. 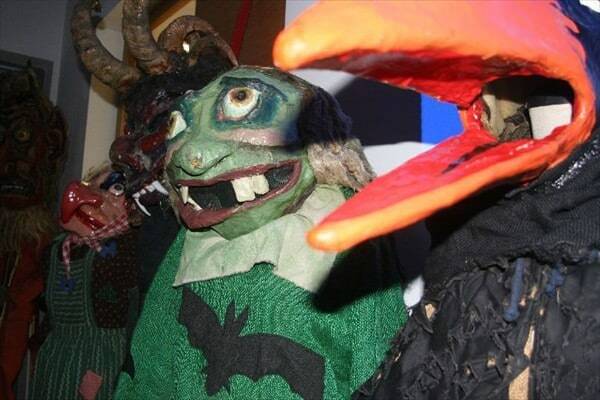 It is taken from the Salzburg’s culture of Perchten with a scary mask made out of wood. Death: The Death has become the protagonist of the furious hunt from the Untersberg and the actual leader of the ghost train. With it’s drumbeats he regulates what is happening. The death plays an important role also in the legends of the Untersberg. Raven: The Raven from the Untersberg is a very mysterious figure in the Untersberg’s myths. He has to wake up the sleeping people of the Untersberg Emperor’s Charles on the day of world will be destroyed. Probably it is meant by this, the Emperor Karl Emperor Charlemagne. But there are also the Emperor Frederick I, Barbarossa and Charles the fifth as possible emperors. Moosweiberl: The Moosweiberl is a typical figure from the Untersberg’s mythology. It comes with the Baumpercht from the forest’s spirits. These two figures form the transition to the dwarves who live in the Untersberg mountain, while marsh and wood people live in the Untersberg forests and marsh areas. Baumpercht: The Baumpercht or Baumwercher comes together with the Moosweiberl of the forest’s spirits. These two figures form the transition to the dwarves who live in Unterberg, while moss and wood people live in the Untersberg forests and marsh area. Hahnengickerl: The rooster is considered a popular imagination as a symbol of vigilance and fertility. It’s cry is said to scare the devil and everything else bad and announces the approach of the sun, the end of the darkness, the dawn and therefore the dawn of a new day. The Hahnengickerl is counted among the general legendary figures of the Flachgau area(the area of Salzburg counts 5 districts and one of them is the Flachgau). The Untersberg-mythology it had announced the beginning and end of each spell. Giant Abfalter: The giant Abfalter, who lives in a ditch at the Untersberg mountain, is one of the typical local legendary figures. He is considered a good-natured and people-friendly, and speaks as a representative of his flock peacefully with the inhabitants of the village of Grödig and exhorted them to lead a pious and honorable life. Bear: The bear represents the strength and bravery. The force of the bear is interpreted as a spring force that defeated the winter. The bear is also a true a symbol of kindness towards the weak. The bear is out in the wild hunt the bear driver and is taken from the Salzburger Perchtenkult. Bear Herder: The Bear herder, who was taken from the Salzburg’s culture of Perchten, is leading in the wild hunt the bear. The bear and bear herder are from the late Middle Ages as typical actors at fairs and during carnival. Witch: The Witch of the Untersberg is also called descendant of the Untersberg’s wild women. The Unterberg’s witch of the furious hunt is very ugly. However, the difference to the wild women of the Untersberg is that the wild women were always described as lovely, gracious and extraordinarily beautiful. 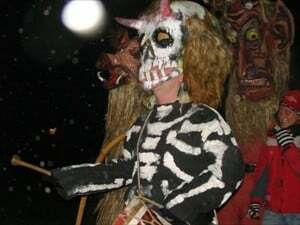 Habergeiß: The “Habergoaß” is described as a general legendary figure of the Flachgau. She is an apparition and is often depicted with a goat head and a three-legged bird body. When the customs group “Jung Alpenland” illustrated the train of the furious hunt two people are needed to form the Habergoaß. The second man has to rely on the other completely, since he does not see anything while he is walking under the back cover. Saurüssel: The Saurüssel is a figure with a pig’s head and comes from the general legendary figures of the region. It is the symbol of “holy boar of the twelve days “. 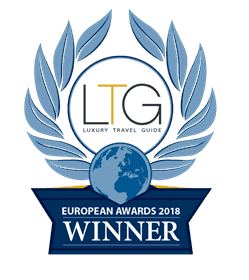 So if you are traveling to Salzburg before Christmas, you may be the lucky one to meet the wild hunting society within the city center or area surrounding the city to the untersberg mountain (usually on the second thursday in the time of advent). In the year 2012 they were also on the big christmas market in front of the main cathedral – the dome – of Salzburg.